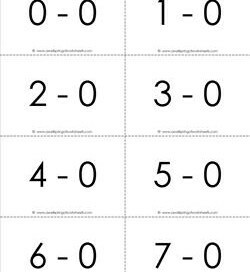 This set of subtraction flash cards includes all the subtraction facts for 0’s for numbers 0-20. There are three pages in black and white. 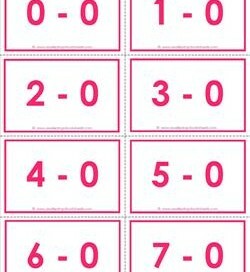 This set of subtraction flash cards includes all the subtraction facts for 0’s for numbers 0-20. Three pages in a soft pink. This set of subtraction flash cards includes all the subtraction facts for 1’s for numbers 0-20. Three pages in black and white. 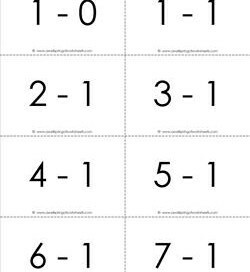 This set of subtraction flash cards includes all the subtraction facts for 1’s for numbers 0-20. Three pages in baby blue. This simple set of subtraction flash cards includes all the subtraction facts for 2’s for numbers 0-20. Three pages in black and white. This set of subtraction flash cards includes all the subtraction facts for 2’s for numbers 0-20. Three pages in a soft green. This set of subtraction flash cards includes all the subtraction facts for 3’s for numbers 0-20. Three pages in black and white. This set of subtraction flash cards includes all the subtraction facts for 3’s for numbers 0-20. 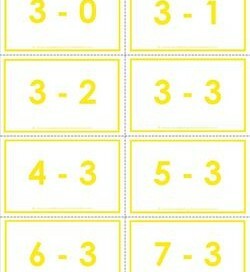 Three pages in a bright yellow. This three page set of subtraction flash cards includes all the subtraction facts for 4’s for numbers 0-20. This is the black and white version. This set of subtraction flash cards includes all the subtraction facts for 4’s for numbers 0-20. Three pages in a soft orange. 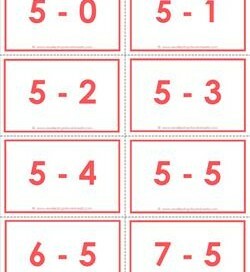 This awesome set of subtraction flash cards includes all the subtraction facts for 5’s for numbers 0-20. Three pages in black and white. This set of subtraction flash cards includes all the subtraction facts for 5’s for numbers 0-20. Three pages in a salmon color. 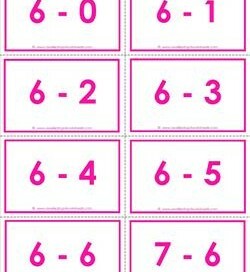 This set of subtraction flash cards includes all the subtraction facts for 6’s for numbers 0-20. Three pages in black and white. 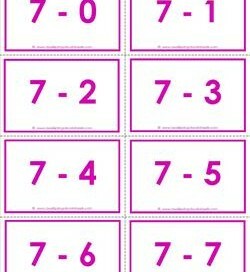 This set of subtraction flash cards includes all the subtraction facts for 6’s for numbers 0-20. Three pages in bright pink. 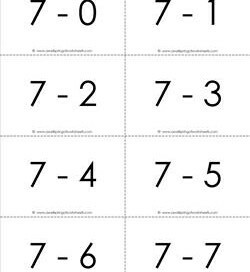 This simple set of subtraction flash cards includes all the subtraction facts for 7’s for numbers 0-20. There are three pages in black and white.